What and Who is something you should read. It was created to solve two of the nation's ills -- unemployment and deteriorating natural resources. NPS Video by Matthew Chuvarsky and Ted Firkins. The natural resources were also in serious trouble. Virgin forests which had once covered 8 billion acres had been reduced to one billion acres by 1932. Each year 3 billion tons of topsoil washed away and a similar amount was blown away. By 1934, 3,300 million acres, one sixth of the nation, was already gone or going. Eleven days after being inaugurated as the 32nd President of the United States, on March 4, 1933, Franklin D. Roosevelt stated, "We can take a vast army of the unemployed out into healthful surroundings. We can eliminate, to some extent at least, the threat that forced idleness brings to spiritual and moral stability. It is not a panacea for all unemployment but it is an essential step in the emergency." 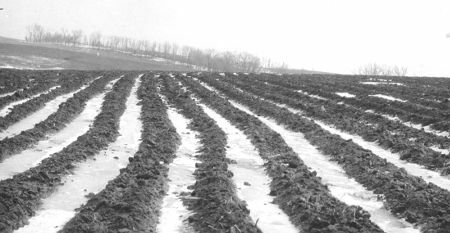 In his message to Congress on March 21, 1933, the President said, "I propose to create a civilian conservation corps to be used in simple work, not interfering with normal employment, and confining itself to forestry and the prevention of soil erosion, flood control, and similar projects." The New Deal program, known as "an act for the relief of unemployment through the performance of useful public work," was passed by Congress and signed by the President, March 31, 1933. 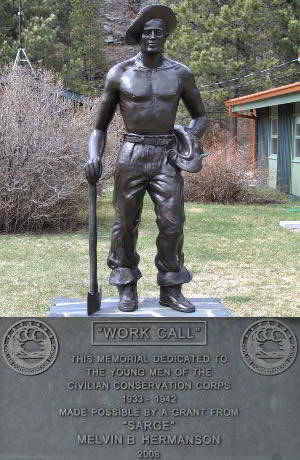 Though popularly called the CCC, this new organization was officially called Emergency Conservation Work (ECW) until July 1, 1937, when the Civilian Conservation Corps Act was implemented. The CCC Act put many of the rules and regulations used for the ECW into law. A major change, however, was the fact that it limited enrollment to 2 years. The first men were enrolled in April of 1933 and the last discharged in July 1942. In South Dakota the CCC provided work for 23,709 enrollees and veterans, 4,554 Indians, and 2,834 supervisory and office personnel. It distributed $6,200,000 in allotment checks to South Dakota families. Enrollees were single males 18 to 25 years of age from 1933 to 1935, 17 to 28 from 1935 to 1937, and 17 to 25 after July 1, 1937. Veterans included several hundred WWI veterans. Indians included those in camps on their reservations. Local experienced men (LEMs) were hired to serve as "straw bosses" for the inexperienced enrollees. All were given board, room, clothing, and medical attention and were paid $30 a month. Veterans, Indians, and LEMs received all their pay, but for 6 years $25 for each enrollee was sent to his parents or guardian each month. In 1939 the family allotment for the enrollee was reduced to $22, and in 1941 it was lowered to $15. Though LEMs were employed to serve as work leaders, numerous enrollees soon gained the experience needed to be rated (promoted) as assistant leaders (comparable to an army corporal) and leaders (comparable to an army sergeant). The pay was $36 a month for assistant leaders and $45 for leaders. The monthly allotment to their families remained unchanged. Each camp was allowed 26 rated men per company (8% assistant leaders and 5% leaders) until the CCC Act raised the maximum number to 10% of company strength as assistant leaders and 6% as leaders. And all were called CCCs, or more commonly CCs. They were organized into separate 200-man CCC companies for enrollees, veterans, or Indians, and lived in CCC camps, except that Indians were allowed to live at home. Camps and camp life were administered by the U.S. Army. Work projects, except in Indian camps, in South Dakota were supervised by technical services - U.S. Forest Service, National Park Service, Soil Conservation Service, Bureau of Reclamation, and Bureau of Biological Survey. The more than 2,800 supervisory personnel in South Dakota included army reserve officers, educational advisers, and technical service personnel (foresters, engineers, conservationists, archaeologists, etc. ), and perhaps 10 to 20 LEMs who were hired by the technical services in each camp. Each company had an educational adviser that supervised education and training programs tailor-made to the enrollees' needs and desires. Each camp also had religious, recreational, and athletic programs. Together the four programs were called "welfare programs" because they were conducted for the welfare of the CCs. More than 50 companies -- 29 composed of South Dakotans -- served in 43 camps at 40 locations: at least 26 camps in the Black Hills area; eleven full-time camps near Alcester, Belle Fourche, Camp Crook, Chamberlain (3), Columbia, Huron, Martin, Pierre and Wall; two camps for three or four summers at Lake Andes and Presho; and four for one summer near Belevidere, Canton, Lake Poinsett, and Watertown. In South Dakota the CCs constructed multi-purpose dams that created lakes which conserved water, reduced flooding, and were used for recreation: one in Brule County, four in Custer, one in Hand, two in Hughes, three in Lawrence, three in Lyman, five in Pennington, and one in Spink. 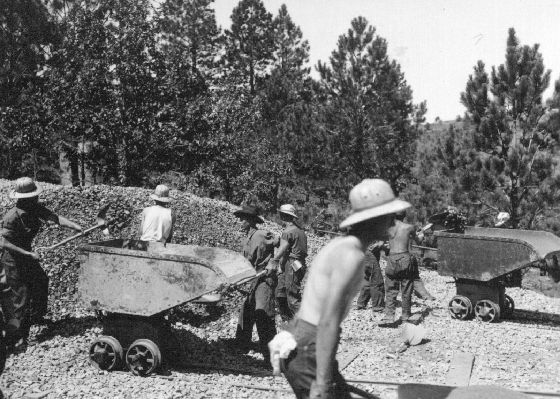 The CCC and WPA cooperated in the construction of Sheridan and were making preparations to build Deerfield when the CCC was discontinued. Perhaps 100 small dams were constructed on small creeks. Under the supervision of the SCS, they were built to impound water for livestock watering in Beadle, Brule, Lincoln, Lyman, Meade, Spink, and Union counties. Similar dams were built in the national forests of Custer, Harding, Lawrence, and Pennington. Other dams in the forests created trout-rearing ponds. Scores of springs were developed in the national forests to provide water for livestock and domestic uses. CCs spent an estimated 75,000 man-days on fire suppression and extinguished approximately 1,000 forest and prairie fires. To prevent fires they removed flammable material from hundreds of miles of road, several thousand acres of nearby summer homes, ranches, campgrounds, etc., and removed "blown-down" timber from another several thousand acres. They constructed an estimated 1,500 miles each of fire trails and telephone line. Though built primarily to aid in fire suppression and prevention, telephone lines also were used by nearby rural residents. Brush and excess trees were removed from over 200,000 acres of pine, giving the remaining trees the opportunity to produce the lumber being harvested today. Recreation areas were developed by CCs at several of the lakes created by the dams they constructed. More than 15 campgrounds, the lodge and cabins at the resort of Blue Bell, and 17 cabins at Sylvan Lake were built. 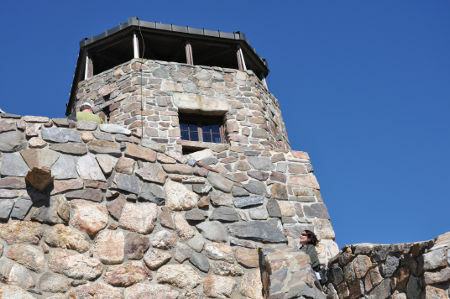 CCs erected the museum, park headquarters building, and custodian building in Custer State Park; built 10 and remodeled the other 5 buildings at Wind Cave National Park headquarters, and constructed the headquarters buildings at Jewel Cave and Badlands National monuments. They installed the water and sewer systems for all the structures in the parks. Many other structures were erected, including houses for the forest supervisor and his assistant in Deadwood; ranger stations at Rochford, Savoy, Camp Crook, and Nemo; lookouts and other buildings at the tops of Mount Coolidge and Harney Peak; and 50 to 100 road bridges, including the double arch bridge over French Creek and pigtail bridges in Wind Cave National Park and on Iron Mountain Road. Wildlife refuges were developed at Sand Lake and La Creek wildlife refuges; big game facilities were built at Custer Sate Park, Wind Cave National Park, and Badlands and Jewel Cave national monuments; and improvements were installed at the zoo in Custer State Park. Much work was done in three city parks. Many improvements were made to Canyon Lake Park in Rapid City and American Island Park at Chamberlain, while a new 1,600-acre park was developed on Farm Island at Pierre. The fish ponds were built at the state fish hatchery at Rapid City. Terraces, contour pasture furrows, sod waterways, and contour farming were demonstrated to the public for their use in conserving moisture and reducing runoff and water erosion. Strip cropping, rough tillage, cover crops, and shelterbelts were demonstrated for use in reducing wind erosion. These demonstrations were conducted in Beadle, Brule, Lincoln, Lyman, Meade, Spink, and Union counties. 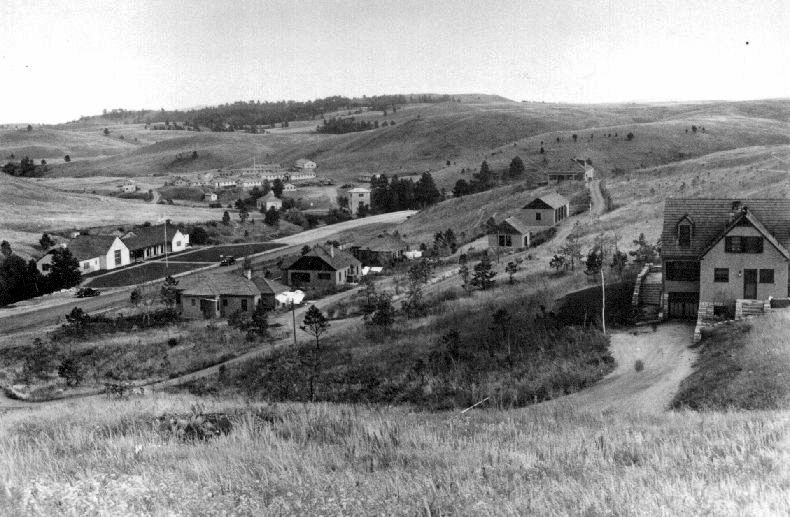 Stock dams, dugouts, and drift fences were constructed and springs were developed to provide water for livestock and allow for better grazing management in these counties and in the national forests of the Black Hills and Harding County. Millions of tree seedlings were produced by CCs for use in planting hundreds of acres of shelterbelts and replanting thousands of acres of "burned-over" forests. Orman Dam and the 654-mile water distribution system of the Belle Fourche Irrigation Project were completely renovated. The outlet at the dam was re built; many miles of canals were lined with concrete; many more were cleared of vegetation; and perhaps 1,000 structures including storm culverts, drops, checks, and spillways were constructed. Little publicized work included the development of Lake Andes, the work done on Lake Kampeska and the Sioux River, and the development of the chain of lakes in Hamlin County. The most notable accomplishment on the chain was the connecting of two pairs of lakes-­Lake Mary with Lake Norden and Dry Lake with Lake Poinsett.